Everyone does it, but why? This article unlocks some of the power in using Time Under Tension (TUT) within exercise prescription for Personal Training clients. So lets take a look at the concept of Time Under Tension and how you can use TUT to choose the correct number of reps and tempo for your clients. What no one ever told me… and what I never understood… was why? Understanding Time Under Tension made the whole ‘number of reps’ thing make sense to me. See how it works for you. TUT is the amount of time a muscle is held under tension for during one set of an exercise. Bench Press, 3 sets of 10 reps.
We can see that the same programme could be carried out very differently and as a result have a totally different effect on our client. How do I Know What TUT to Use with My Clients? When we look at choosing a Time Under Tension for our clients the first step is to decide what the aim of the training is. Do we want to build muscle? Is it an increase in strength we are after? Or is it an improvement in muscular endurance? Looking at the energy systems graph below you can see some of the main components of fitness that you may train with your clients. What we are going to do is look at the same exercise and how we can alter the tempo and the TUT to change what effect that exercise will have on our client. Let’s look at an example of power training. Power is the ability to be explosive. Being powerful requires lots of energy very quickly and therefore we use our ATP-PC energy system. The Time Under Tension for power training would be 5-10 seconds. Strength training also demands high levels of energy output. We are lifting the heaviest loads we can so we will need to work at a high intensity for a short period of time. 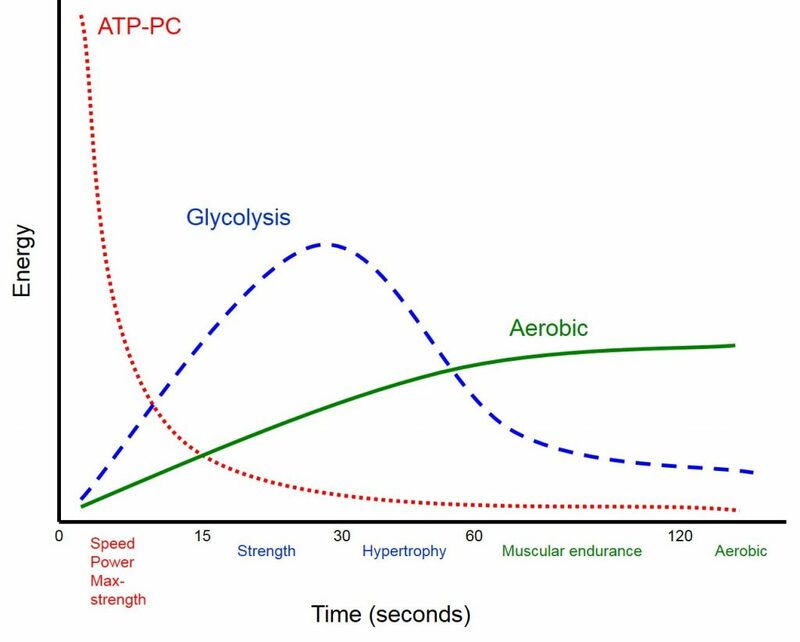 Strength will use both the ATP-PC energy system and the early part of our anaerobic energy system. Time Under Tension for strength training is in the 10-30 seconds range. Hypertrophy training requires us to work the muscles for longer. We still want to work at a reasonably high intensity, using the anaerobic system. We want to fatigue the muscles and cause muscle damage. This will cause a hormone response (testosterone and growth hormone) that will increase our muscle size. The TUT for hypertrophy training is 30-60 seconds. Muscular endurance training requires lifting a weight for more than 60 seconds. Therefore the weight can’t be very heavy to begin with (40-60% of their max lifting weight). As the weight is lower, the body doesn’t have to provide energy at such a quick rate. Muscular endurance tends to use the aerobic energy system more (with some anaerobic contribution). How do I use Time Under Tension with My Client? Now that you understand what Time Under Tension is, how do you use it? First, what are you trying to achieve with this client? Really think about this…. Did my 40 year old female client say she wants to ‘tone’? As a Personal Trainer I might decide that for my client to ‘tone’ I want to build some muscle and do a separate cardiovascular programme to help her metabolise fat? Now, hypertrophy doesn’t mean I turn my client into Arnie (or Mrs Arnie). For for this client it means rebuilding the muscle she has lost since her 20th birthday. Now how experienced is my client? Is my client new to training? If my client is inexperienced and new to training then slow controlled tempo it is – 2:1:2. Therefore 5 secs/rep x 8-10 reps = 40-50 seconds, putting me nicely in hypertrophy. So my sets will look pretty standard. Start with 2. After 4 weeks I might progress it to 3. I will set the load so that the intensity for my client will be at a 6/10. The exercise is not complicated for my client to follow, but I can clearly explain why the programme is written the way it is. In conclusion, understanding Time Under Tension increased my confidence as a Personal Trainer with programme writing. Furthermore, it gave me more options on how to change an exercise programme and add variety. So instead of changing all of the exercises each month I was able keep the client’s favourites and just change TUT to give them a new challenge.